The Best Copenhagen Attractions Across The Scandinavian City! 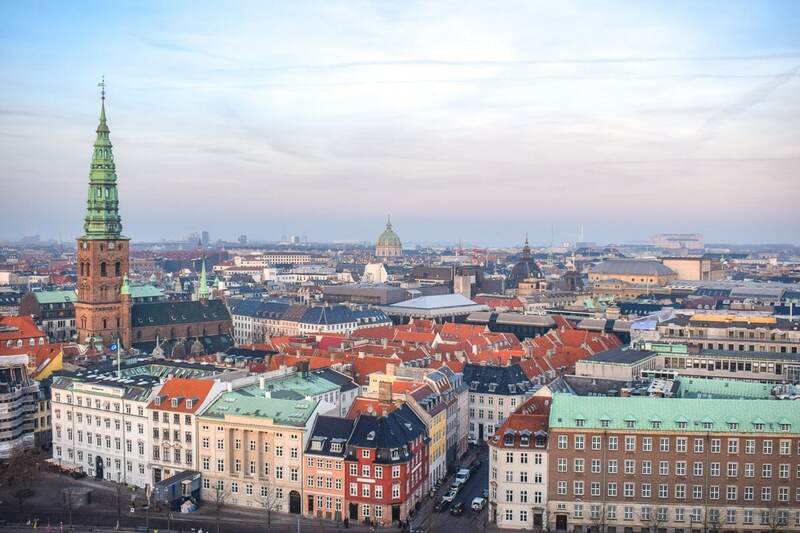 Oh, Copenhagen – a city that will forever hold a place in our hearts! The Danish capital is a fantastic city to explore regardless of what you are interested in seeing. There are plenty of things to do in Copenhagen whether you are visiting in any season for any budget – day or night! 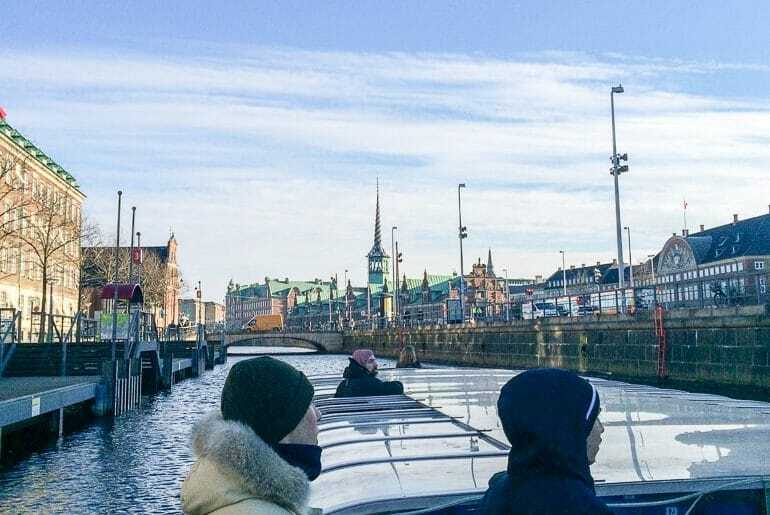 Yes, you can find great things to do in Copenhagen even in winter! Of course, we may have a slight positive bias. Eric originally visited Copenhagen in the winter and still had a great time. Lisa lived in Copenhagen for 3 years during her time in university. Between the two of us, we’ve covered most of the free attractions in Copenhagen and even some of the paid ones. In all seriousness, Copenhagen is an energetic city alive with locals and tourists alike. What other city has mermaids and the very real reality that you might get run over by a bicycle? Not many. From the well-known attractions like Nyhavn Harbour and Tivoli Gardens to the lesser-known and unique things to do in Copenhagen like visit Christiania, here are some of the best attractions in Copenhagen! 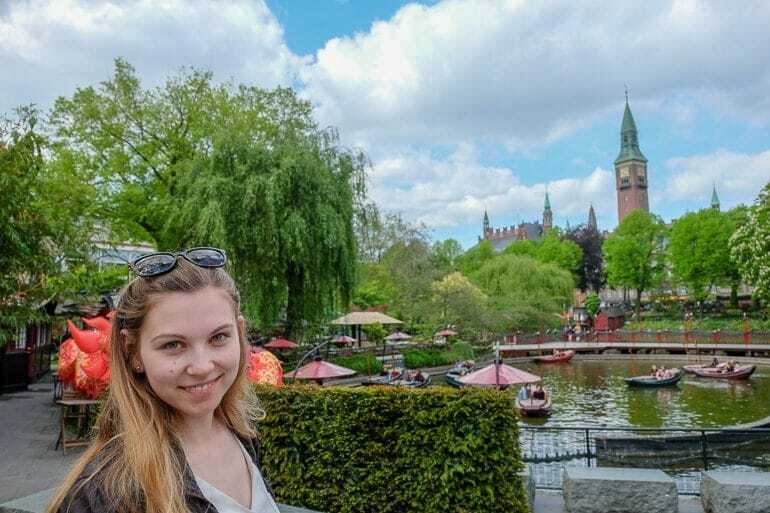 Before you travel to explore the Danish capital, here are a few things you should consider before you head to Copenhagen! We’ve covered getting around, when to visit, and where to stay in brief below! Even in winter time – Eric loved the flat boat harbour cruise he went on! As for the best time to visit Copenhagen, this would greatly depend on what activities you are planning to do! The warmer months are obviously more popular – with June through August bringing the summer heat but also the crowds. The summer is generally more expensive for accommodations, etc. The spring months or even June are a good as the weather warms up. Same goes for the fall – cooler temperatures are still pleasant to wander the city. If you wanted to see Tivoli all lit up at Christmas time, you can visit Copenhagen in the winter time. Eric first visited in February and had a great time exploring the city. Just bundle up, find great cafes, and mix up the indoor/outdoor activities. Copenhagen has a great mix of things to do in all seasons so you aren’t completely screwed in any season, honestly. You can check out our packing list for Europe if you need help with packing. Getting around Copenhagen is pretty easy and you’ve got a few great options to choose from. The city is pretty spread out but flat so walking is definitely an easy option. The exercise is good and the neighbourhoods are very pretty to wander in and out of. The public transit system is excellent and consists of the metro and buses. The metro runs 24/7 because there’s no driver.. which There are also S-trains which are used for longer distances – so you likely wouldn’t use them unless you were heading on a half day trip to Bakken (see below). To plan routes and learn about fares, here’s a link to the Copenhagen transit website. It’s a great system with a Rejsekort – just load up the card and tap on and tap off the bus, train, or metro to “close” your journey. Simple! If you wanted to feel like a local Dane, you could always take a bike around Copenhagen. It’s been said that in 2016 – for the first time in the city’s history – the number of bicycles outnumbered the number of cars on the road. This is a testament to how bike friendly Copenhagen is. The biking lanes/infrastructure are among the world’s best so you will have no worries about biking in a new city. For visitors, it’s important to remember that the bike lanes are just as serious as the car lanes. Bike rentals are also relatively inexpensive if you use it to get around the whole city for a day or more. Plus, you save on transit passes and/or parking fees! If you wanted to tour like a local Dane, you could do a guided Copenhagen bike tour! If you are coming to Copenhagen for a few days, you will need a place to sleep. Lucky for you, we have actually written a whole guide on this: where to stay in Copenhagen without going broke. That said, there are lots of places to stay (even in the city centre) that are affordable. You just have to know where to look! If you are in a hurry, you can just check now for accommodation in Copenhagen. If you are looking for a hotel, check out The Good Morning+ Copenhagen Star and have a look at Copenhagen Generator for a great hostel (both located in the city centre). Eric loved his stay in Copenhagen Generator – it even made our list of great hostels in Europe we’ve stayed at! Okay, so here’s the piece you’ve been waiting for – the top attractions in Copenhagen. These are in no particular order – but we did put Nyhavn at the top! If you know what things to do you are looking to do and see, you might even get started looking for line skip tickets to Tivoli Gardens or your flat boat cruise tickets below since the summer season can be busy! 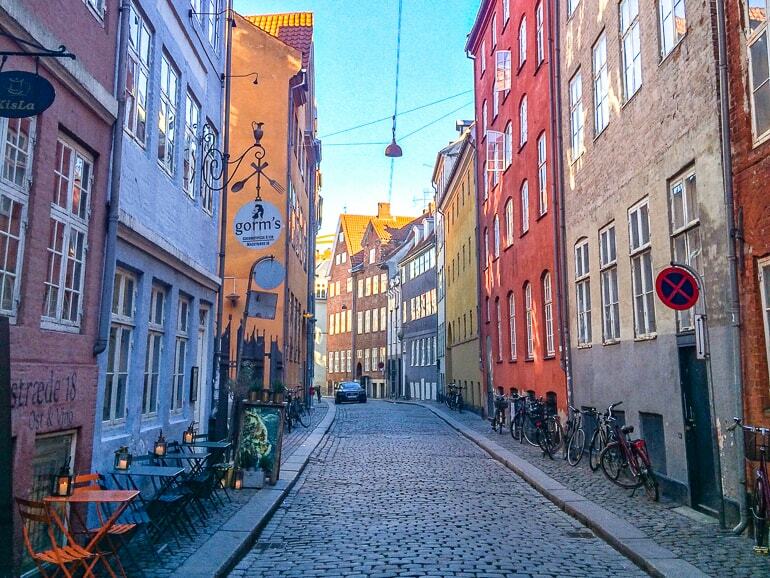 The quintessential colours of Nyhavn – just beautiful. Yes, we decided to start with the heavy hitter and get it out of the way first. 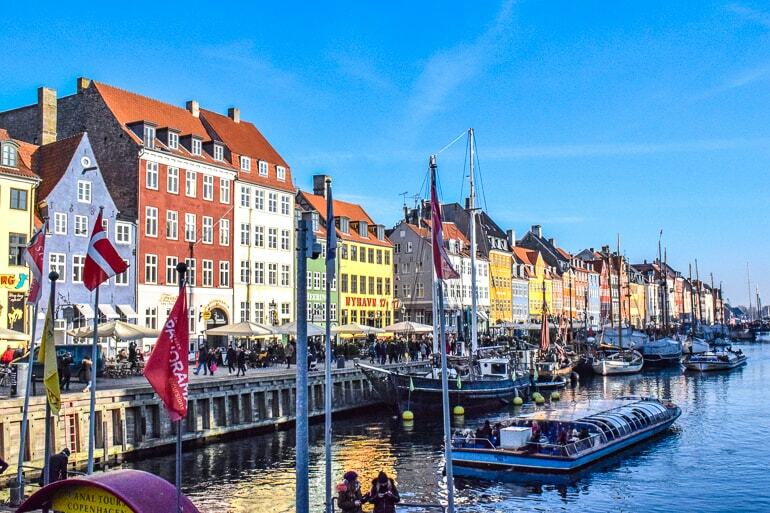 Nyhavn is one of the main tourist attractions in Copenhagen – and for good reason! The harbour was finished in 1673 and believe it or not, it was originally a strictly commercial port. The colourful houses that we see today were only built in the 18th and 19th century. As such, there’s a ton of history surrounding the harbour. Hans Christian Andersen, a famous Danish author we will talk about in the next section, actually lived in some of the houses. For today’s visitors, there are lots of cafés and restaurants but they tend to be a tad pricey. Our advice is to just enjoy a drink and the hustle and bustle of the harbour. Explore Copenhagen and Learn About the City on a 2-Hour Copenhagen Local Walking Tour! The one, the only – The Little Mermaid. 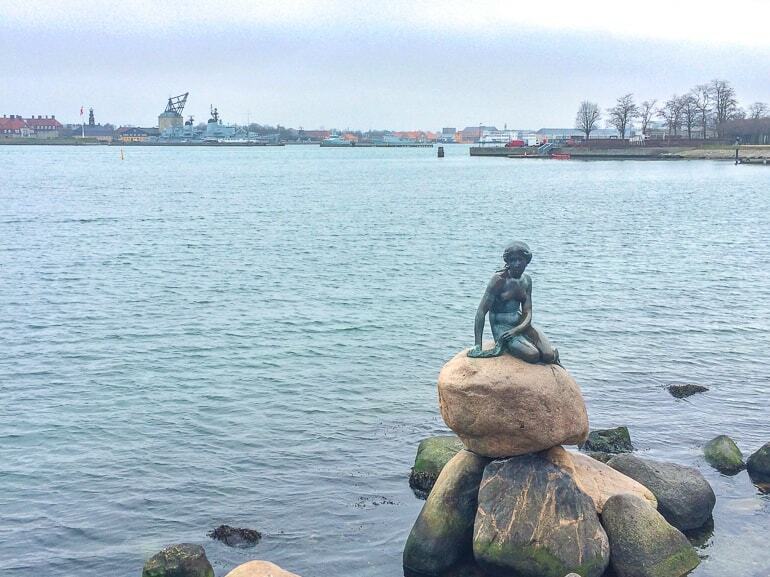 If you’ve spoken to anyone who has visited Copenhagen, they will probably tell you to go and see the Little Mermaid. Of course, they are referring to the famous statue that sits along Copenhagen Harbour to commemorate the character once written about by Danish writer Hans Christian Andersen. This bronze and granite statue is perched on a rock on the west bank a little walk north of Nyhavn Harbour. You can usually find her by looking for the crowd of people standing on a sidewalk seeming to peer into the harbour at nothing! Get closer and you’ll see her sitting there. Be sure to grab a photo – she’s over 100 years old! You can read more about her here. The castle in the park is absolutely stunning and cool to check out! Rosenborg Castle is located on the corner of Konges Have (“King’s Garden”) which we’ll mention again further down. The castle was built by King Christian IV in the early 17th century (1606), but the original intention was that it was to serve as a summer house. Today, visitors can buy a ticket and go inside – just make sure to check the opening times beforehand! 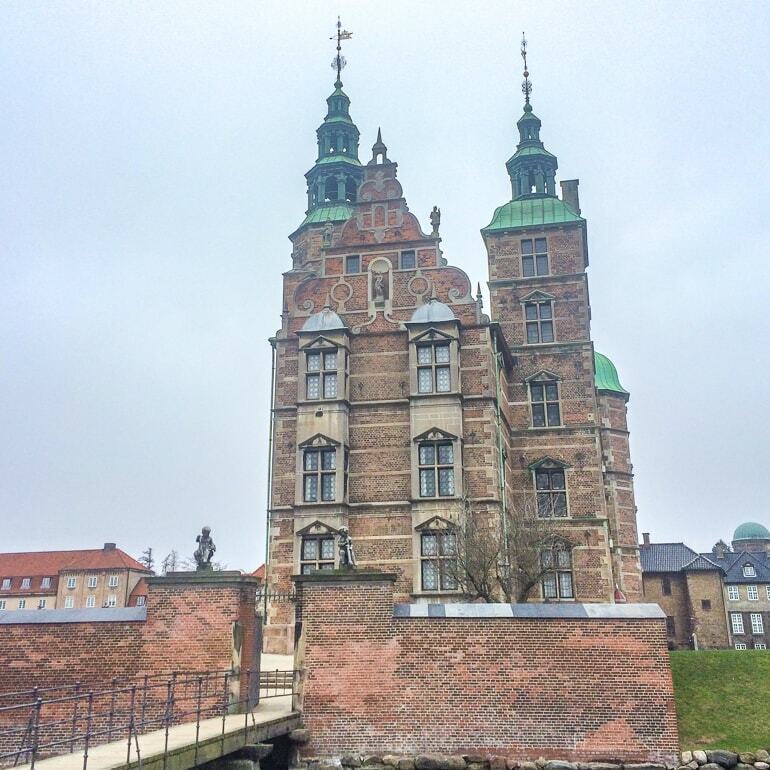 Inside the Castle, you’ll find Denmark’s crown jewels. Another highlight is the Knights’ Hall in which you can see the coronation thrones and three silver lions that are standing guard. Did we mention that these lions are life-sized?! Here’s more information about Rosenborg Castle. As one of Europe’s longest pedestrian streets, Strøget is a great way to see the heart and soul of Copenhagen lifestyle. The street is over 1.1 kilometres – and lined with lots of different shops that range from the cheaper chain stores to the really expensive brand you’d expect to see. There are even a few local additions that are worth checking out! 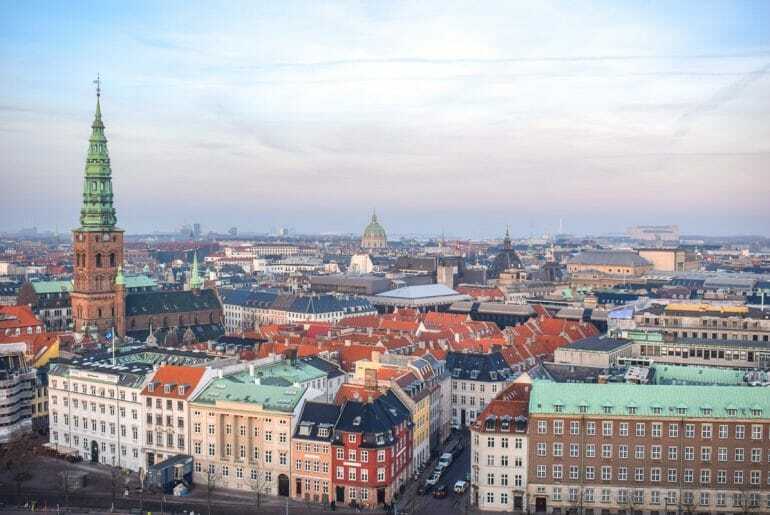 For orientation, you can find the Copenhagen City Hall at the south end and the Kogens Nytorv Square with the Royal Danish Theatre and Nyhavn Harbour at the North end. Read more about the famous shopping street here. Under the whimsical lights, this amusement park is very famous to the Danes and all Copenhagen visitors. Tivoli first opened on August 15, 1843 – making it really, really old. It’s like walking into a time capsule! Fun Fact: Tivoli is the second oldest operating amusement park in the world. Thanks for taking the crown away, Bakken! In Tivoli, you can ride the wooden roller coaster from 1914. It’s one of only seven roller coasters in the world that still has a brakeman on board! Because of the rich history, Tivoli is the most-visited theme park in all of Scandinavia. We recommend visiting in the evening as the park is all lit up from the lights in the trees and on the rides. It’s like another world. To learn more about Tivoli, you can check out the website. When you want to visit Tivoli during the main tourist season, definitely consider getting a Tivoli line skip ticket. Eric wandered in accidentally not knowing it was the Marble Church! The green dome makes this landmark hard to miss! 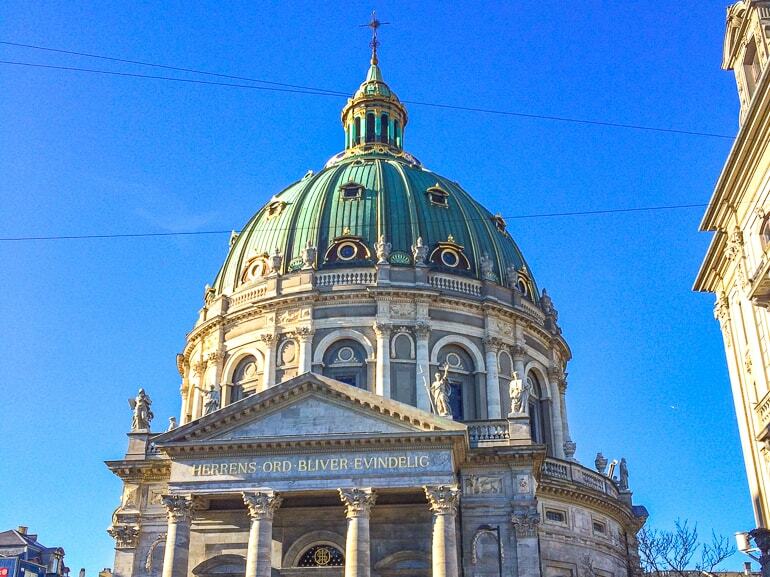 Frederiks Kirken, or “The Marble Church” is located to the west of Amalienborg Palace. The church counts as one of the most impressive churches in Copenhagen and we can absolutely understand why: it’s beautiful inside! While the foundation stone was laid in 1749, the church wasn’t officially inaugurated until 1894! For today’s visitors, the church is open to the public every day and the dome can be visited at 1 pm and 3 pm every day during the summer months (and at the same hours on the weekend during the winter). 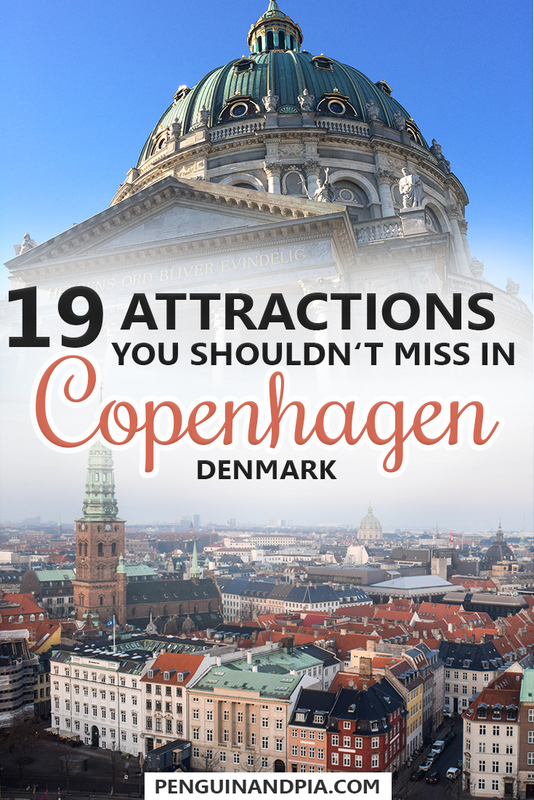 To learn more about visiting times, check out this post from Visit Copenhagen. The views from the Round Tower are really stunning! Built back in the 17th century, the “Round Tower”, as it’s called in English is definitely a sight to see – and climb! After you pay admission, you’ll walk upward on a spiral ramp up and up and up until you reach the top. Exit the door and you’ll be greeted by 360-degree views of Copenhagen from well within the city. Don’t worry, the edge of the observation deck is surrounded by a strong iron fence that will keep you safe to take your photos and enjoy the view! You can also choose to visit the observatory – which is the oldest functioning observatory dome in Europe. They have added a new glass floor so visitors can see the core structure of the tower. Pretty neat if you ask us! To read about opening hours and prices, you can check out the official website here. Welcome to the oldest and most visited park in central Copenhagen! Kongens Have or “The King’s Garden” is the beautiful grassy area closer to Nørreport Station. We mentioned Rosenborg Castle above in this post, which is situated within the park. The park is a great place to walk through, or grab a blanket and enjoy a picnic. On a very sunny day, you’ll find locals sharing food, playing games, having drinks, you name it! We once bought a whole pizza and had drinks under the sun and it was the best afternoon EVER. It’s no wonder Denmark is considered one of the (if not the) Happiest Countries on the Planet. If you want to learn about “hygge”, a term used to describe the Danish culture of “togetherness” – then take a tour to experience Danish culture with a local and see for yourself! The tower is worth the climb – and the galleries inside are interesting, too! 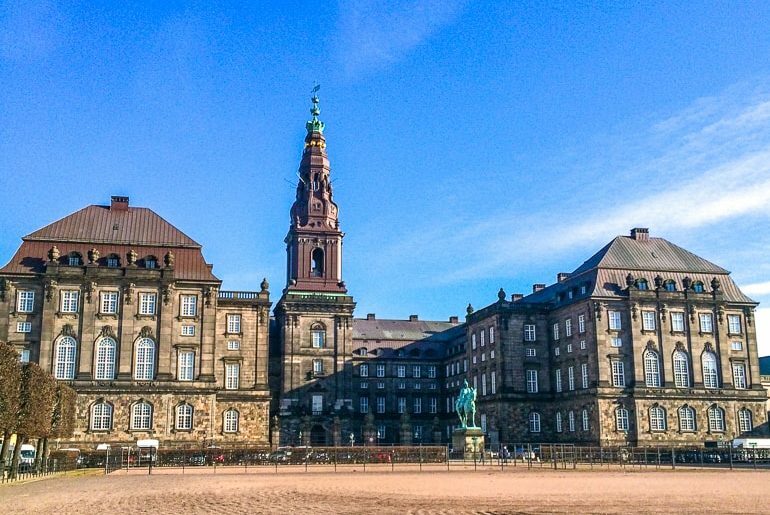 Technically located on the tiny island of Slotsholmen (it doesn’t feel like an island), Christiansborg Palace is where the Royal Danish family carries out official duties. The Palace is also a multi-function place – containing the Danish Parliament Folketinget, the Supreme Court, and the Ministry of State. The grounds are huge and you can buy tickets for tours of different royal areas. 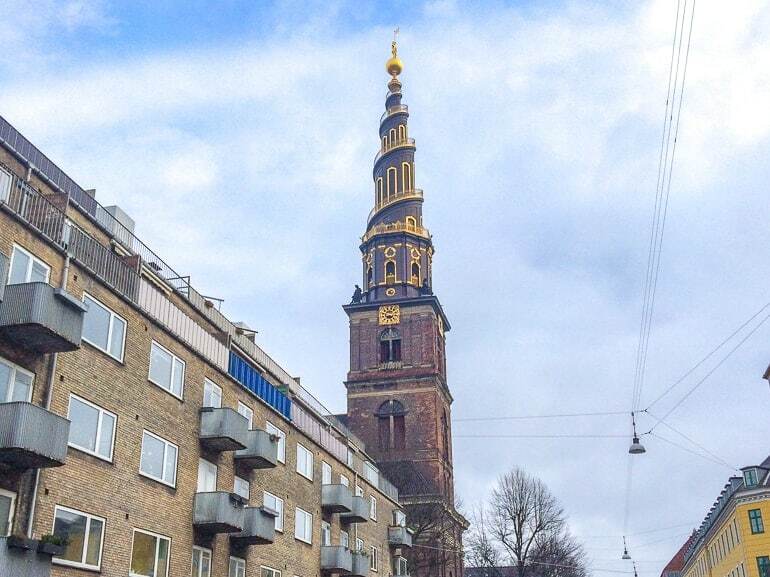 The highlight for us is the tower which offers 360-degree views of Copenhagen. You can even see Malmo, Sweden from up there! The tower entrance is free – however, the can often be a line up to head up to the viewing tower as the elevator is quite small. There’s also a restaurant up there which you can make a reservation for. We’ve seen many beautiful sunsets from up there. To learn more about the Palace, check out the official website. As the official residence of the Royal Family, Amalienborg Palace consists of four identical buildings and a large courtyard that features the equestrian statue of Amalienborg’s founder, King Frederik V. Inside the Palace, history buffs can visit the museum that showcases centuries of Danish history. Amalienborg is probably best known to visitors for the daily “changing of the guard”. Each day at 12:00 noon, the Danish Royal Guards (called Den Kongelige Livgarde) march from the barracks near Rosenborg Castle all the way to the courtyard. To learn more about visiting hours and logistics, visit the website! Did you want to see one of the best preserved star fortresses in Northern Europe? Oh good, because Copenhagen has that, too. These days, the Kastellet serves as a park and historical site. Back in the day, however, the Kastellet was a key piece of the fortification of the Danish Capital. The grounds are free to roam and offer visitors sights like the church, windmill, and smaller historic military buildings. We’ve explored the grounds and walked up on top of the high outer perimeter. You get quite the perspective from up there! Go check out the citadel – you won’t be disappointed! Learn more about it here. You can tour the building and climb the City Hall Tower! 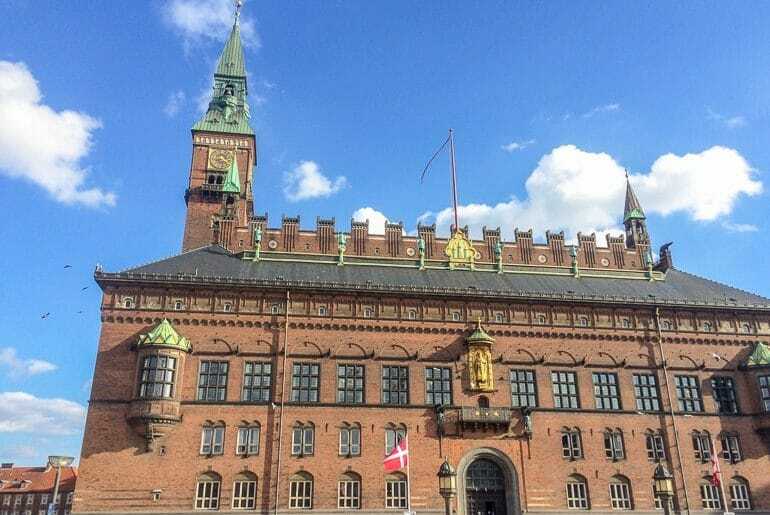 Completed in 1905, Copenhagen City Hall is the official seat of the Lord Mayor of Copenhagen. It was done in a Romantic style and was actually made to resemble the city hall in Siena, Italy (which Eric has seen in person and honestly – he can see the resemblance)! 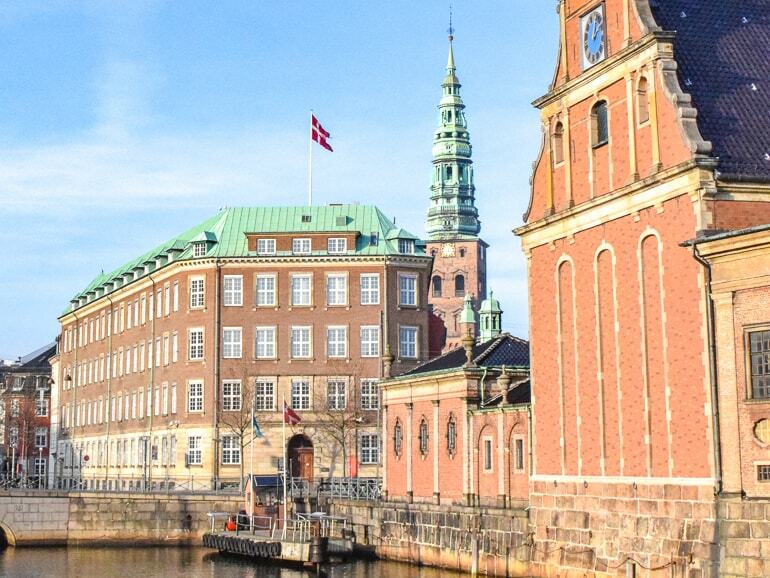 While you can tour the historic city hall freely during opening hours, the top attraction for visitors to Copenhagen is the tower! 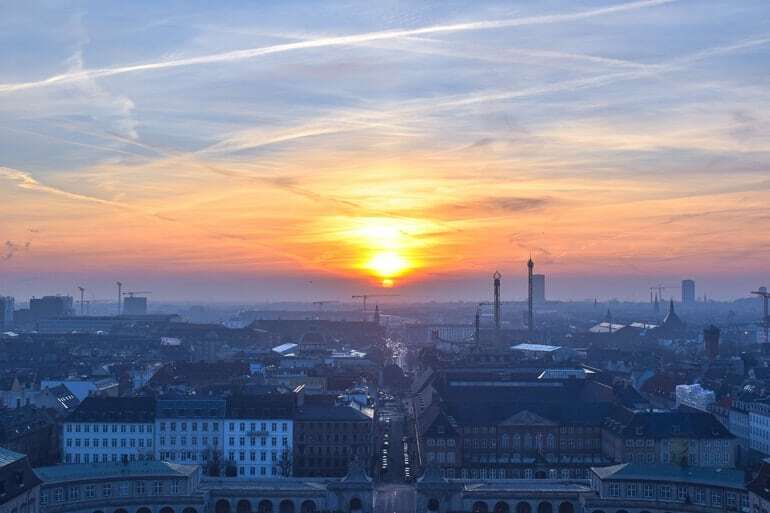 City Hall Tower – standing at over 105 metres – is among the tallest towers in the whole of Copenhagen. You do need to be taken up there by a guide so it’s best to plan ahead. 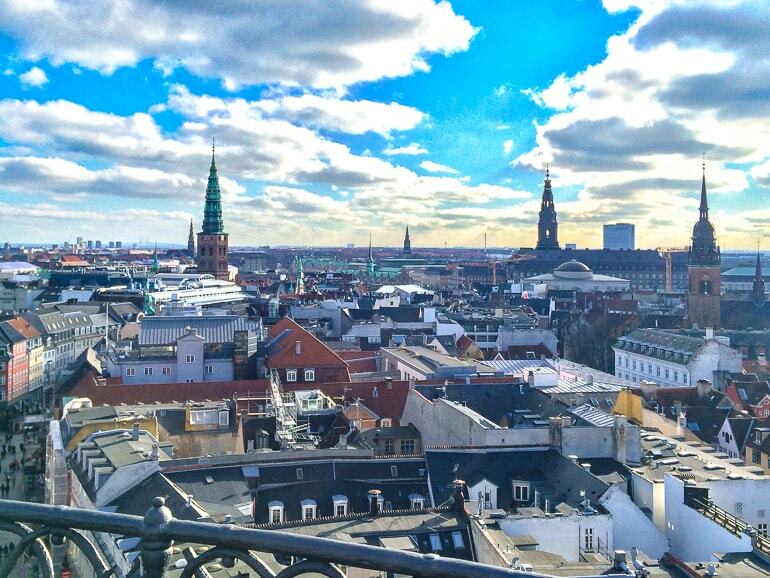 There’s about 300 steps to the top for great views of the inner city of Copenhagen. Here’s more information about guided tours and visiting City Hall Tower! As for the square in front, City Hall Square is popular for exhibits, public gatherings, and it’s the start/end of the famous shopping street Strøget. At night, it’s a beautiful place to wander through to see the lights to get a sense of the city at night. There is tasty food at each stall – so go and explore! Torvehallerne – located behind Nørreport Station, this food market is encased in glass and looks beautiful from the inside and out! Inside, you’ll find shops and stalls selling fresh fish and meats, to cheeses, gourmet sliders, fresh bread, etc. 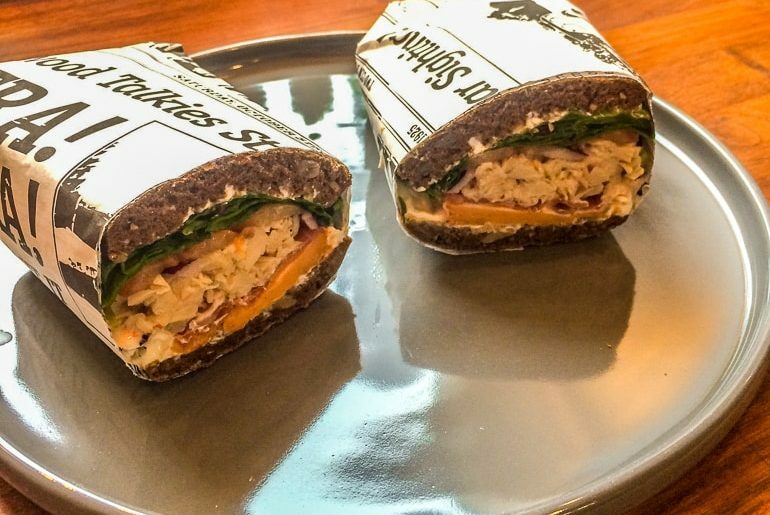 If you’re looking for lunch or looking for groceries, you’ll find them here. Papirøen – this was THE very famous market set up in a large harbour warehouse close to Christiania. There were so many food stalls and options for cuisine it was absolute torture trying to choose what you wanted to eat. Now, that has been replaced with Reffen – a massive indoor/outdoor food market on another small island and warehouse complex. You will definitely find us there when we are back in Copenhagen. You can read more about Reffen here. Learn about (and eat!) amazing Danish food on a guided food tour around Copenhagen! If you’re into museums, you can visit the National Museum of Denmark. Home to the exhibit of Danish cultural history. Open Tuesdays to Sunday, 10:00 am to 5:00 pm, the museum offers visitors a wide range of Danish exhibits from the Bronze Age until today. The Museum also has exhibits from other timelines and regions around the globe. There’s even a restaurant if you get hungry looking at all that history! Find out more about the National Museum of Denmark here. Hope you brought your climbing shoes! 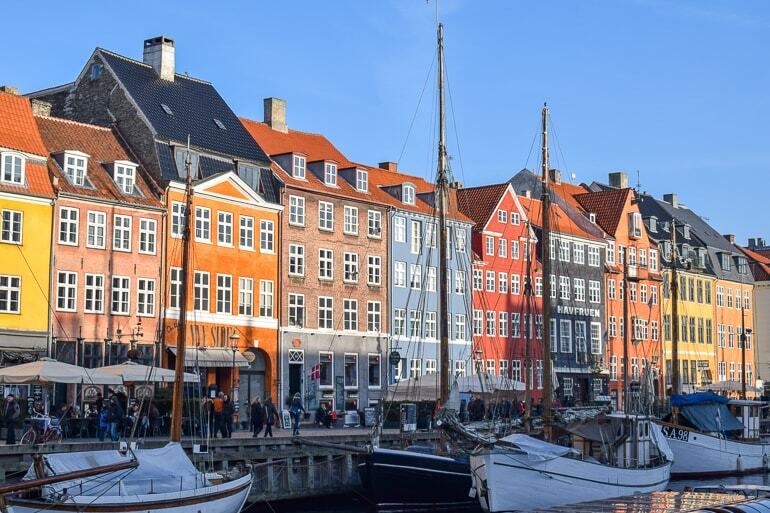 Located in the east end of the city centre in the Christianshavn district of Copenhagen, you’ll find a spiral tower rising up from the buildings below. Go climb it! The baroque-style church of Vor Frelsers Kirke serves as an active parish for over 8,000 people. The oak spiral tower on top is what draws many visitors! While the church was built in the 1680s, the spiral spire wasn’t completed until at least 50 years later. The view is one of the best from within the city – but the climb up in the strong winds can be a little scary! To check out the church, visit their website. Want to visit the oldest amusement park in the world? You can do exactly that if you’re in Copenhagen! Dyrehavsbakken, also known as “Bakken” is a fantastic wooded park area and amusement park north of the Copenhagen City Centre. Just take the S-train towards Klampenborg. As we mentioned above, Bakken is old. How old? Well, the park was officially opened in 1583 making it the oldest operational park in the world. They feature dozens of attractions – including a wooden roller coaster that was built in 1932. Bakken is good fun for the whole family and makes a great day or half-day trip from the city centre. Here’s all the information you’d need to visit Bakken! Since Copenhagen is a port city, the water plays a huge part in the city’s vibe. This means that you should go explore the city from the water’s perspective! There are many companies and boats you can take to tour the canals and the harbour. Some of the larger flat bottom boats are completely open air while some have a glass covered dome for the winter time. Here’s the other small pier to get on the flat boats – it’s in front of Christiansborg Palace. Eric visited in February but was too excited to sit under the glass and so he sat in the uncovered section of the glass boat. There’s a reason Copenhagen is one of our favourite European cities to see in the winter! He says it was worth every second to take in the cold sea air! You can book the popular Canal cruise here. Remember that the flat boats can leave from two different places: Nyhavn Harbour (shown in first photo) and the canal right in front of Christiansborg Palace (shown in second photo). The Botanical Garden is located in the middle of Copenhagen very close to Nørreport Station. The gardens cover an area of over 10 hectares and have 27 glasshouses which can be visited. The gardens were first established in 1600 but have been moved twice to the current location in 1870. The coolest glasshouse is definitely the old Palm House. Built in 1874, the highest point is 16 metres tall and has a cast-iron staircase leading up to the walkway at the top. The gardens have over 13,000 plant species and two cafés – in case all the plant life makes you thirsty. Definitely check out the Botanical Gardens – visit the official website. There’s one part of Copenhagen that attracts many curious visitors year after year, In fact, it’s not even part of Copenhagen. Founded in 1971 by a group of hippies, Christiania is truly a “free state” – an area ruling autonomously to Copenhagen and the Danish Government. You can visit Christiania which has plenty of markets, organic eateries, galleries and artisan shops, and more. There are signs about what to do and what not to do when you enter – you should follow these rules carefully and you won’t have any problems. The main one: be careful what you photograph since the dealing of hash is a well-known industry in Christiania (although it’s still technically illegal). To learn more about Christiania, you can read up here. So, there you go! 19 things to do and see while you’re visiting Copenhagen. We could have gone on forever, but frankly, our fingers kinda hurt from typing! What do you think? Did we cover all your favourites or did we miss anything? If you travel to Copenhagen, be sure to refer to our guide and come back here to tell us what you enjoyed! We’re happy to hear about Copenhagen.